Best Hawker Food in Penang - 10 Dishes that Will Make You Want More! The second smallest state of Malaysia is mainly well known for two things: Amazing street art and that you get some of the best hawker food in Penang. While the street art was everything we hoped for, it was the food of Penang that really blew our minds. Rarely we found such an amazing hawker and street food scene like in the delightful city of George Town on Penang Island. But let’s not waste too many words but jump directly to the thing that really counts. We proudly present to you the best hawker food in Penang. Let’s start with what is considered the national dish of Malaysia, Nasi Lemak. This delicious and fragrant coconut rice dish is a common breakfast in Malaysia and Singapore. Also, it’s a greatly loved street food in Penang. The rice is cooked in coconut milk and spiced with pandan leaves, bay leaves and ginger. The tasty local food in Penang is traditionally served with sambal, anchovies, cucumber, peanuts and a boiled egg. Also, often you can get additional meat in form of squid, fish, chicken or beef. We recommend trying the chicken rendang. If you order Nasi Lemak from a Hawker, you usually get the whole dish wrapped in a banana leaf. We think that Nasi Lemak earns the title of best breakfast in Penang. This Penang Hawker Food has its roots in the Hokkien province of China. There are three main versions of this meal: Penang Hokkien Mee, Singapore Hokkien Mee and the Kuala Lumpur version of Hokkien Mee. What makes the Penang version so special is, that it is the only version made with a spicy prawn broth. The other two versions base on stir-fried noodles. The main ingredients of Penang Hokkien Mee (also called Penang Hae Mee) are yellow egg noodles and thinner rice vermicelli. The spicy broth is made of prawn heads, prawn shells and pork ribs. Usually, you will find some prawns, hard-boiled eggs, bean sprouts, shallots, sambal, lard and pork meat in your bowl of Hokkien Mee. Don’t miss out on this food to eat in Penang. Another must-try food in Penang is doubtlessly the Char Kway Teow. It is a dish made of flat rice noodles (kway teow) which get stir-fried (char) over very high heat. Additionally, there are some other ingredients added, like dark soy sauce, prawns, chillies, bean sprouts and eggs. Originally, the Char Kway Teow is made with pork fat, but as the main part of the population in Malaysia is Muslim, you’ll often find a halal take on it. As this dish is so loved in Penang, there are many different versions available and the chance that you will have the exact same version twice are almost not existent. While Char Kway Teow can be found broadly in Malaysia, Singapore, Brunei and Indonesia, the best version Char Kway Teow is considered to be found in Penang Malaysia. There, you can even find “gourmet” versions of this delicious dish with ingredients like duck eggs, crab meat or other seafood. In our opinion, Char Kway Teow is a must-eat food in Penang. The next dish in our “Best Hawker Food in Penang” article even made it to place number 7 of the CNN Travel “The world’s 50 best foods” list. Asam Laksa, in general, is a sour, tamarind and fish-based soup. Asam is the Malay word for any ingredients that make a dish sour. The Penang version of Asam Laksa (also sometimes written as Assam Laksa) is made with mackerel soup which is enriched with tamarind, galangal, lemongrass and chilli. Typical garnishes include thinly sliced onion, prawn paste, mint and pineapple slices. A lot of people think that Asam Laksa is the best street food in Penang. Curry Laksa is the other one of the two main versions of Laksa and a delicious food in Penang. While Asam Laksa is a sour fish soup with noodles, Curry Laksa is a coconut curry soup with noodles. Mostly, thick rice noodles called laksa are used for this tasty Malay dish. In Penang Curry Laksa is called Curry Mee. The reason for this is, that in Penang yellow mee noodles instead of laksa noodles are used to create this dish. The main ingredients of the Curry Mee, besides the coconut curry broth, are mee noodles, cockles, shrimps, bean curd puffs and mint. Typically it’s served garnished with coriander and a spoon filled with sambal chilli paste. This way you can decide how spicy you’d like to have your Curry Mee. 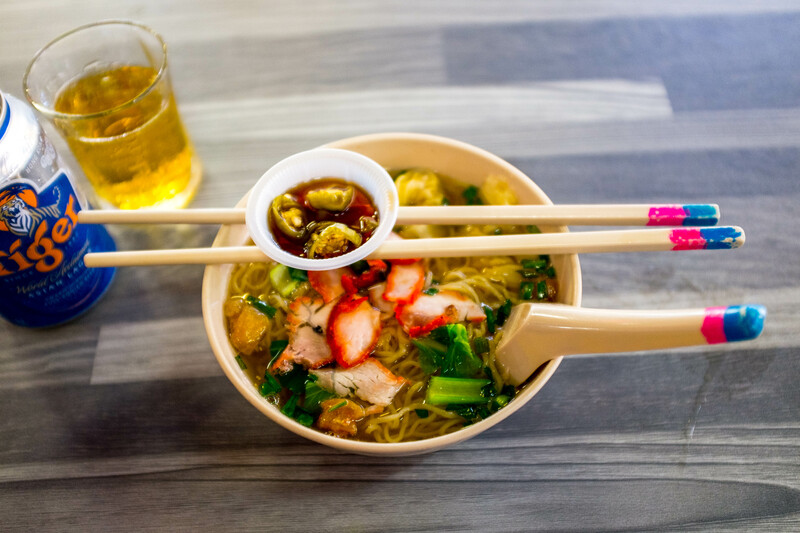 Lok Lok is the best Penang hawker food if you are a fan of pick’n’mix. The concept is very simple. You have food on a stick which you then tip in boiling hot water until it’s done. After that, you dip it into one of the available sauces and savour it. Because there is not really a rule for what kind of food needs to be on the stick, you can find many different Lok Lok hawker stalls everywhere in Penang. Most of these hawkers have at least three basic dip sauces: a sweet dip sauce, a chilli dip sauce and a spicy peanut sauce. The type of food can be a choice of various vegetables and mushrooms, any imaginable meat and fish, century eggs and seafood. Every stick has a certain colour on its end to indicate the cost of it. This makes it perfect to enjoy Lok Lok, no matter if you’re starving or if you just want a little evening snack. This dish was one of our favourite meals during our Malaysia travels and Penang had truly the best version of it. Wanton Mee consists mainly of a hot broth, filled and garnished with mee noodles, wantons and leafy vegetables like for example Chinese kale. What differentiates the Malay version from others countries versions is, that in Malaysia the Wanton Mee also includes pork slices. And while in most regions of Malaysia you’ll get those slices barbequed, they are mostly grilled in Penang. Also, the Wanton Mee in Penang is normally accompanied by a spoon of sambal and pickled green chillies. You can get this dish in either broth version or dry version. Wanton Mee is undoubtfully a recommended food in Penang. You maybe heard of this dish in another name: Bakmi Goreng. It basically means “fried noodles” and it is a flavourful and spicy noodle dish mainly popular in Singapore, Brunei, Malaysia and Indonesia. The main ingredients are mee noodles, onions, garlic, Chinese cabbage, egg, tomato and other vegetables and a choice of meat. One variation that is very popular in Malaysia is “Maggi Goreng”. This style of Mee Goreng is made with Maggi instant noodles instead of mee noodles. This might sound a bit “cheap”, but they are actually really delicious and a good food in Penang. The Fish Head Curry is one of the most expensive meals you can get in any hawker centre in Penang. This dish with Chinese and Indian origins was one of my personal favourite dishes I ate in Penang. The curry is made in Kerala-style with various vegetables like eggplants, tomatoes or ladyfingers. The highlight of this unique food in Penang is the head of a fish (mostly red snapper), which is semi-stewed in the curry. It is normally served with a side dish of rice or bread. If you dare to eat this recommendable dish, you will be rewarded with a beautiful taste explosion! I saved the most famous food in Penang for the end. Nasi Kandar is the best rice-based meal I had during our whole 9 month trip through South East Asia. The essence of this from Penang originating dish is steamed rice. Sometimes you can choose between normal rice and flavoured rice. You then can add a mix of various side dishes according to your taste to the rice. These side dishes can be amongst other things fried chicken, curried beef, fish, lamb, squid, okra, aubergine. What makes this dish so fantastically delicious are the curries though! A mix of various different curries is poured over the rice and gives it a unique taste. While it might sound weird to mix different curries, like for example fish curry and beef curry, it works absolutely perfect. In my opinion, Nasi Kandar is the best food in Penang. That said, I had some great Nasi Kandar in Ipoh as well. -> Visit the Food Museum Penang. The Wonderfood Museum Penang is a great opportunity to learn more about the rich food culture of Penang and Malaysia. There are over 100 street food replicas exhibited, some in gigantic proportions. You can get the tickets when you get there or order them already online. -> Make a trip to the Chulia Street Night Hawker Stalls. You can grab some of the best street food in Penang there. -> If you would rather discover all the delicious food with a guided tour, then we recommend booking this 3-hour long tour with 10 stops. This way you can try loads of different dishes within a compact time. -> Check out this post about what to do in Penang in 3 days if you want to experience more than food. -> If you are interested in the food scene of Malaysia, then have a look at the other post we wrote about the Best Food in Ipoh. We also have a lot of other great food-themed posts on our page. Chances are high that you enter or leave Malaysia through its capital, so check out our ultimate Kuala Lumpur Guide. -> You plan to stay in Penang? Then check out this handy guide to find out where to stay in Penang.